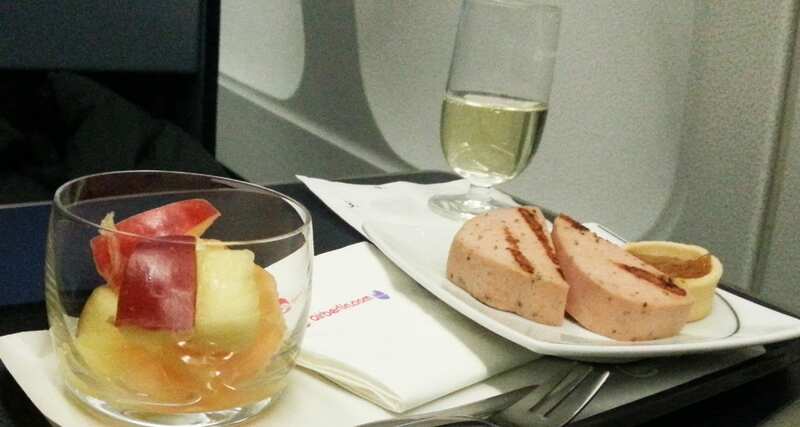 Air Berlin recently invited me to sample their inflight menu offerings on a flight from Dusseldorf to Los Angeles aboard one of their newly refurbished A330 aircraft. 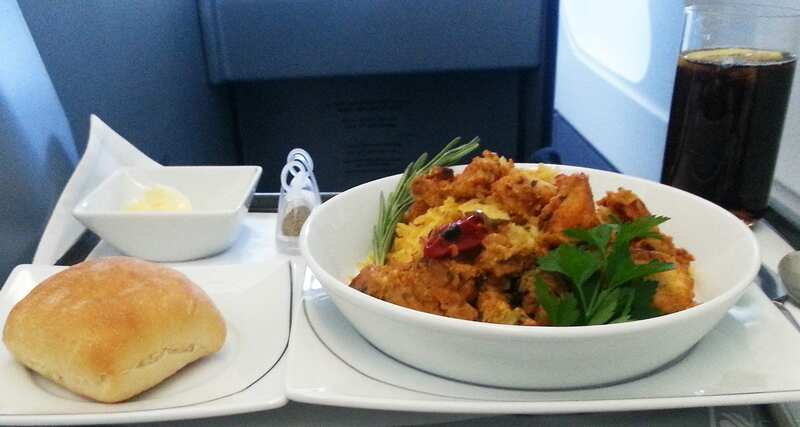 Air Berlin business class meals are created by the Sansibar restaurant which is on the German island of Sylt. The airline offers a very well stocked bar at 35,000ft including Prosecco from Italy, 13 different spirits, a range of German Beers as well as soft drinks and plenty of hot drinks to choose from. For starters: A carpaccio of Zucchini with Shrimps marinated in lemon juice and small diced peppers. There are four main dishes to choose from which makes it so difficult to pick only one to eat. The choices include Butter chicken with Basmati rice and mint chili, Osso Buco, Limances rolls in alfredo sauce and pasta triangoli in a juniper sauce. The cabin crew uses fresh herbs to garnish the plate, and after the first taste, I am convinced it’s probably the best butter chicken meal I’ve sampled in a while. The chicken is moist, the rice is perfect (and not dry), and the spicy Indian butter sauce is just perfect. For dessert, the options include Tiramisu tartlet or an Emmenthal and Tete de Moine cheese plate. The cabin crew offers me both options to sample; the Tiramisu is delicious. While not a big fan of cheese plates this one is excellent with quite a variety of flavors, but for me, sweet options will always win. About halfway through the flight, it’s time for the intermezzo dish consisting of a fresh fruit salad and a Bavarian meatloaf with orange mustard and potato arugula salad. It’s the perfect mid-flight snack, quite light and typically German. I couldn’t believe there was a third meal service on this 10.5-hour flight. The meal consists of slices of pork fillet with pumpkin salad, balsamic cream and roasted pumpkin seeds. A Swiss chocolate cake and chtipiti cream cheese accompany the dish if that’s not enough throughout the whole flight you can also choose from a range of snacks including chocolate bars, Italian cookies, Pretzels and peanuts in various flavors. A restaurant in the sky that’s for sure the airline offers a beautiful selection of local and international dishes for business class customers to choose from. If business class is not an option, the airline offers economy class passengers the choice to pre-order a Sansibar inspired meal on flights over 60mins and under 6 hours in duration.